The Garies narrates the fortunes of two families over several decades. Clarence Garie is a slaveholder living in Georgia with Emily, his slave and common-law wife, and their two children, also named Clarence and Emily, depicted here on the book’s cover. Because their marriage is not legally recognized in Georgia, and their children therefore considered illegitimate, they decide to move north to Philadelphia. The story written by Frank J. Webb, an African American, is a fictionalized account based on true events the author witnessed while living in Philadelphia. The growing racial tensions in nineteenth-century Philadelphia erupted in riots that took place in 1834, 1838, 1842, and 1849, which Webb turned into the central event of the novel. 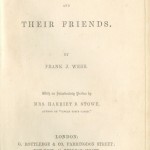 The Garies and Their Friends, by Frank J. Webb, was initially published by the British publisher George Routledge in 1857. Routledge published two editions, which featured prefaces by Lord Brougham, who was influential in abolishing slavery in Britain, and Harriet Beecher Stowe, author of Uncle Tom’s Cabin. The Garies and Their Friends is among the earliest novels written by an African American. Although it is not strictly a historical novel, The Garies reflects the deteriorating conditions of the free black community in Philadelphia during Frank J. Webb’s childhood and early adulthood. One of the Philadelphia riots that helped inspire the central theme of The Garies was the Lombard Street Riot. Increased job competition in among ethnic and racial groups, in particular between Irish and black workers, brought intermittent fighting that exploded into a full-scale riot in August 1842. As a black temperance society began a parade on August 1 to promote temperance and celebrate Jamaican Emancipation Day, a flag they carried depicting a slave breaking his chains and the rising sun of freedom was misinterpreted and offended white--in particular, Irish--bystanders. As the parade reached the public market near Lombard and Sixth Streets, a melee quickly ensued, the parade broke up, and black marchers were chased throughout the city. 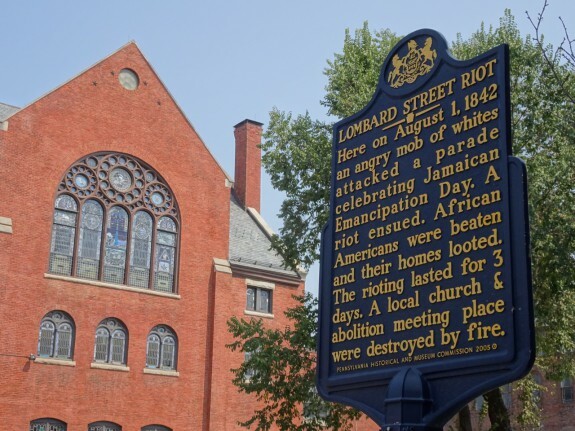 By the end of the day a mob torched an abolitionist meeting hall and the Second African Presbyterian Church on St. Mary’s Street (today called Rodman Street). The Lombard Street Riot continued for two more days and caused many black citizens to flee the city. As the sheriff and deputized citizens attempted to subdue the mob, the predominately Irish rioters turned against them, and public order was only restored after the mayor called out seven militia companies with more than one thousand troops. This clash with law enforcement officials stigmatized the Irish in Philadelphia and set the stage for the next large-scale riots in antebellum Philadelphia. The politics surrounding the Appeal of Forty Thousand Citizens also is reflected in The Garies. As the Pennsylvania Constitutional Convention approved changes to the language of Article III to allow voting rights to only "white freeman" in January 1838, members of Philadelphia's black community quickly established meetings to fight the ratification of the new constitution. Robert Purvis was the chairman of a seven-member committee, created during a public meeting at Saint Paul's Lutheran Church in February 1838, entrusted to create a public appeal to persuade others to reject the new state constitution. On March 14, 1838, Purvis read the text of the Appeal of Forty Thousand Citizens to an audience at the First Presbyterian Church of Philadelphia. 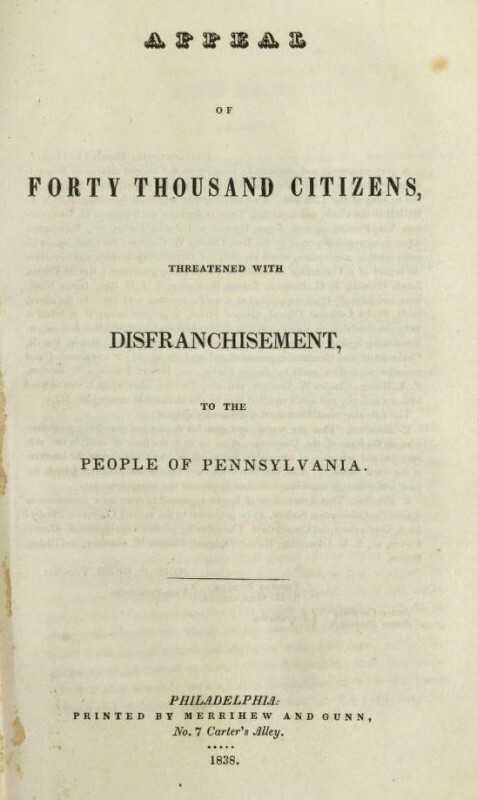 Within a month of being read to the public, Philadelphia press Merrihew and Gunn published the appeal as a pamphlet, with the title page pictured here. 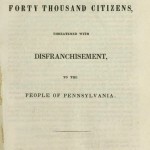 To view a full transcript of the Appeal of Forty Thousand Citizens, visit the Historical Society of Pennsylvania website. 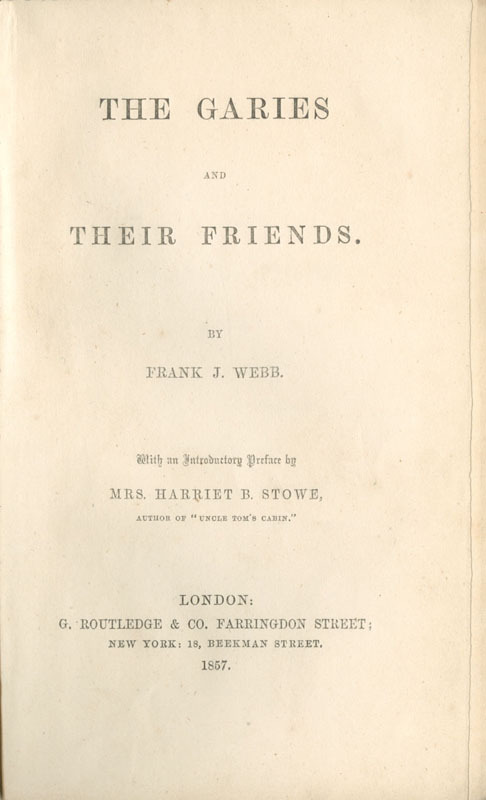 Published in London in 1857, Frank J. Webb’s The Garies and Their Friends is among the earliest novels written by an African American. Although it is not strictly a historical novel, The Garies reflects the deteriorating conditions of the free black community in Philadelphia during Webb’s childhood and early adulthood, in particular, the 1838 disenfranchisement of black men by the Pennsylvania legislature and the anti-abolitionist and anti-black violence of the 1830s and 1840s. Born to free blacks in Philadelphia, Webb (1828-94) was the youngest of his parents’ five children, one of whom died in infancy. His father, Francis Webb (1788-1829), was educated and active in various church and civic organizations, and his mother, Louisa Burr Webb (1784-1878), was the illegitimate, mixed-race daughter of former U.S. vice president Aaron Burr (1756-1836). Francis and Louisa participated in an unsuccessful colonization project in Haiti, returning to Philadelphia in 1826, sixteen months before Frank’s birth. The Garies narrates the fortunes of two families over several decades. Clarence Garie is a slaveholder living in Georgia with Emily, his slave and common-law wife, and their two children, also named Clarence and Emily. Because their marriage is not legally recognized in Georgia, and their children therefore considered illegitimate, they decide to move north to Philadelphia, where they are met and welcomed by Mr. and Mrs. Ellis and their three children, Esther, Caddie, and Charlie. We follow the Garies and the Ellises as they raise their children in an atmosphere of often vicious racial discrimination. The light-skinned Garie children are forced to leave their school after it is discovered that they have a mixed-race mother and the white parents object. Later, Charlie Ellis finds that his skin color prevents him from being hired for positions that he is otherwise qualified for. When an “Abolitionist” businessman offers to take him on as an apprentice, the other employees in the office refuse to work as long as Charlie is permitted to remain, and so Charlie is let go. The central event in the novel is a graphically-rendered race riot, evoking the historical riots of 1834, 1838, 1842, and 1849. In Webb’s fictionalized account, two plots spur the violence: a plot by greedy and jealous whites to destroy and take possession of black-owned property, and a plot to defraud the Garie children of their inheritance. Mr. Walters, a wealthy black investor in real estate, probably based in part on the prominent Philadelphia businessman and activist James Forten Sr. (1766-1842), converts his home into a temporary fortress and, with the Ellises, successfully defends his property from the violent mob. The Garies are less fortunate. Mr. Garie is shot as part of the scheme to claim his estate, Mrs. Garie dies giving birth to a stillborn child, and little Clarence and Em are left orphans, swindled of their inheritance. The novel’s final six chapters take place “many years” later. In New York, Clarence Garie is exposed attempting to pass as white. He returns to Emily—who has stayed in Philadelphia and chosen to identify as black—and dies. For the other characters, though, the plot has a conventionally happy resolution. Mr. Walters marries Esther Ellis and Charlie Ellis marries Emily Garie, whose inheritance is restored. The Garies was initially published by the British publisher George Routledge in both a “cheap series” edition and a “library” edition. Webb’s novel was not read widely in the United States , and the only known book review in the United States was reprinted from a London source in Frederick Douglass’ Paper. Both Routledge editions featured prefaces by Lord Brougham (1788-1868), who was influential in abolishing slavery in Britain, and Harriet Beecher Stowe (1811-96). 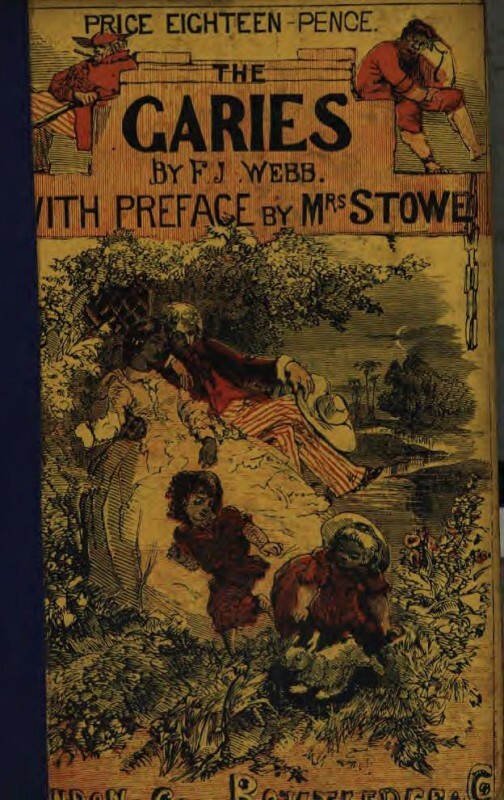 (Stowe was acquainted with Webb, as his wife Mary gave dramatic readings of scenes from Uncle Tom’s Cabin.) 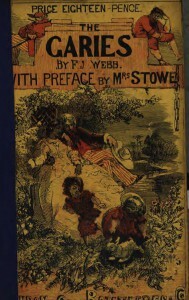 Stowe’s preface casts Webb’s novel as addressing whether “the race at present held as slaves [are] capable of freedom, self-government, and progress.” It is precisely this perceived emphasis on representations of black bourgeois respectability, to the exclusion of a more direct attack on the institution of slavery, that led the first wave of twentieth-century critics to denounce Webb’s novel as insufficiently principled. 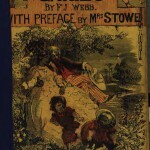 More recently, critics have emphasized the novel’s depiction of racism and discrimination in the North, what Werner Sollors called “an encyclopedia of manifestations of racial hatred and segregation from cradle to grave.” Sollors also observed how closely Webb’s representation of antebellum racism anticipated the major concerns of the civil rights movement, including housing and employment discrimination and segregated schools. Lapansky, Phillip S. “Afro-Americana: Frank J. Webb and His Friends.” In The Annual Report of the Library Company of Philadelphia for the Year 1990. Philadelphia: Library Company of Philadelphia, 1991, 27-38. Maillard, Mary. “‘Faithfully Drawn from Real Life’: Autobiographical Elements in Frank J. Webb’s The Garies and Their Friends.” Pennsylvania Magazine of History and Biography 137.3 (July 2013): 261-300. Otter, Samuel. Philadelphia Stories: America’s Literature of Race and Freedom. Oxford and New York: Oxford University Press, 2010. Webb, Frank J. Fiction, Essays, Poetry. Ed. Werner Sollors. New Milford, Conn.: Toby Press, 2004. Webb, Frank J. The Garies and Their Friends. Eds. William Huntting Howell and Megan Walsh. Calgary: Broadview Press, forthcoming. Various editions of The Garies and Their Friends, Library Company of Philadelphia, 1314 Locust Street, Philadelphia. 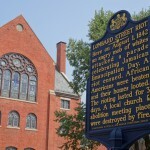 Lombard Street Riot Historical Marker, southeast corner of South Sixth and Lombard Streets, Philadelphia.